WHAT DO YOU DO when you’re a quirky bit of modern art and the museum that hosts you has been shuttered for missing the rent? Futher, let’s assume your creator’s homeland regards your “art” as political blasphemy and let’s also stipulate that you are, say, a fifteen-foot-high chromed head of Vladimir Lenin with a tiny baby balanced on its top. 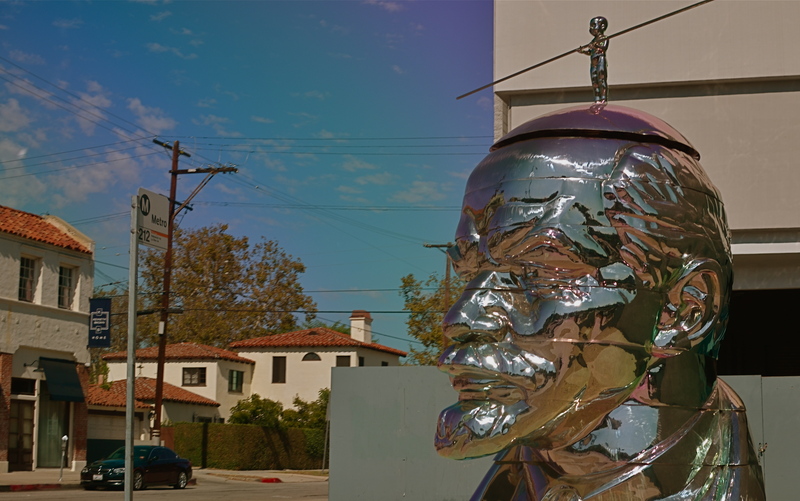 I Caught Lenin when he did L.A. But here’s the take-away for photographers. Part of our job is to freeze the human drama as it shifts and morphs. That means being particularly sensitive to the things in society that change the quickest, including the fashion waves of the art world. And if serious art falls out of favor quickly, art that is loaded with satire or irony really races to the front of the obsolescence checkout. Weird ain’t forever. Lenin and Miss Mao found by 2017 that it’s hard to stay a head (sorry) when the ACE Museum was evicted, leaving the work essentially homeless. Zhen and Qiang tried in vain to land the Commie Chromedome a new roost in China, but the Big Red One basically told them to pound sushi (humorless bunch, those socialists). What’s a murderous goateed revolutionary to do? At this writing (June 2018), the most recent citing of Vlad’s Big Head was at the site of a trucking company near Newberry Springs, California, in the Mojave Desert, property owned by artist Weiming Chen, a friend of the Gao brothers who operates the area as a kind of statuary boneyard for his own works and those of others. A snapshot taken of the head showed Lenin looking characteristically defiant, although absent the lovely Miss Mao. I like to think she’s found peace as the hood ornament for a 1966 Diamond Reo rig highballing down CA-10. Hey, I can dream. So, I treasure my 2014 snap of the head in situ in L.A. (seen above), back when life was good and fate was kind. Photography is commentary, but often, the top comment that comes to mind is something like “okaaaaay, so that happened..” No matter: it’s always worth a grin, and usually worth a picture. As with Miss Mao, it’s a balancing act. This entry was posted on June 24, 2018 by Michael Perkins. It was filed under Americana, Art, Arts and was tagged with Public Art, Street Photography.